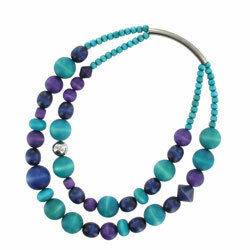 This bold blue statement necklace features a combination of turquoise, blue and purple wooden beads. With two layers, the vibrant blue bead necklace will add a vibrant splash of colour to your outfit for any occasion, be it an informal gathering of friends or a wedding. Made from sustainable wood, the beautiful blue wooden bead necklace is lightweight, eco-friendly and durable so a great investment for your jewellery collection. Also available in mixed red and mixed green.